Swimmers compete at the Preble County Swim meet on Saturday, June 27. The meet saw seven teams who were represented by over 300 swimmers compete, making it the largest in the meet’s seven-year history. The Stingrays took home first place overall and had three most valuable swimmers. Swimmers compete at the Preble County Swim meet on Saturday, June 27. The meet saw seven teams who were represented by over 300 swimmers compete, making it the largest in the meet’s seven-year history. The Stingrays took home first place overall and had three most valuable swimmers. Swimmers dive into the pool during the Preble Invitational on Saturday, June 27. The Stingrays won the event, taking first place in 18 events at the meet which featured over 300 swimmers. 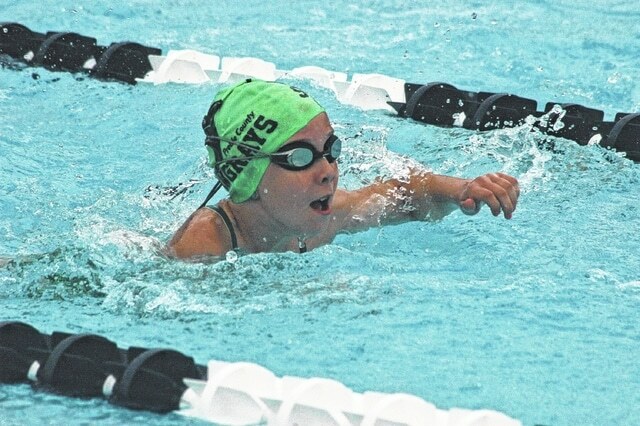 EATON — The Preble County Stingrays hosted the eighth annual Preble County Invitational at the Eaton Community Pool on Saturday, June 27. The weather did not prevent athletes from competing at the event, and it was the biggest invitational to date for Preble County. The meet saw over 300 swimmers, representing seven teams compete. Despite facing such a large field, the Stingrays came out victorious at the meet, winning with a total score of 1,624 points, topping second place finisher Cassel Hills Piranhas who finished with 1,095. In the annual Stroke for a Cure Campaign against Breast Cancer, the teams were able to raise $497 to give to the Susan G. Komen Foundations. After the purchase of awards, all proceeds raised will go to the Susan G. Komen Foundation. First place winners for the Stingrays include the relay team of Olivia Cochran, Emily Haynes, Addyson House, and Noelle Bassler who won the Girls eight and under medley relay in a time of 2:08.80. The boys under eight medley relay team of Austin Peace, Ethan Gregory Ben Todd and Jackson Chapin won with a time of 2:18.80. For the nine and ten-year-old girls medley relay, the team of Emma Slade, Joslynn Beneke, Josey, Meeks and Rachel Honaker won with a time of 1:33.79. The girls 11 and 12 100 medley relay team of Belle Streets, Rebekah Honaker, Madelynn Baker and Maddie Haynes won with a time of 1:18.34. In the boys 15 to 18 age group, the 200 medley relay team of Trey Gregory, Drew Pool, Mason McCargish and Ryan Bassler won with a time of 2:05.26. Individual first place winners included Mason McCargish, who was also named most valuable swimmer for his division and won the 50 Meter Freestyle with a time of 26.57. He also won the 200 meter freestyle with a time of 2:12.39. He continued his dominance in the freestyle by winning the 100 meter freestyle with a time of 59.20, and wrapped up a strong weekend by winning the 50 meter butterfly in a time of 28.62. Cochran was named most valuable swimmer. Including first place in the girls’ under-eight medley relay she also won the 25-meter backstroke with a time of 26.36. Madelynn Baker was also named most valuable swimmer at the meet. Baker won her division in the 25 meter backstroke with a time of 18.24 and the 50 meter freestyle in a time of 34.14. Emily Haynes won the 25 meter breaststroke with a time of 29.14. Austin peace also won the event for his age group with a time of 29.26. Drew Pool won the 50 meter breaststroke in a time of 35.94, and Tyler Gregory won the 50 meter backstroke in a time of 33.42. Noelle Bassler won the 25 meter Backstroke in a time of 43.82 and Callie McCargish won the 50 meter butterfly in 36.09. Despite the weather, Head Coach Dave Montgomery was pleased with the turnout for the invitational. “It was not the best day for a swim meet but the kids and parents stormed through it and we ended up getting most of the meet in,” Montgomery said. H noted, they had to cancel some of the later relays to get the entire individual meet completed. The Stingrays’ season is already winding down as the team will travel to the Miamisburg Pool on Saturday, July 11, to compete in the SOSL Championships.